Note: This light comes with Heavy Duty Battery clamps only. This light is available with an AC plug for an additional $10 please follow link for AC plug https://www.amazon.com/dp/B01MT63CC3 or contact us for special orders·Note: All orders are shipped within 1 business day with 2-3 day priority mail. So you should receive the item within 3-4 business days no matter what the estimated shipping says. Bright Night For A Brighter Fishing Future Model: Bright Night 15000 Features: · 15000 lumens · 300 LEDs, 25 ft cord · Lights up to a 30' diameter depending on water clarity and depth. One light will run up to 43 continue hours on one fully charged deep cycle battery. · LEDs will last 50,000 hours · Self-sinking no weights needs · 360 degree lighting to light up all the water around you! · Made of industrial PVC and high quality clear plastic · The LED's are surrounded and completely sealed with clear plastic tubing to making them completely water tight for extra durability. · All connectors are water tight and tested before shipment. · Light are used underwater so you can attract all the fish with out attracting all the bugs · Color of end caps are black. the light will be shipped with Battery terminal clips unless a AC plug is requested and paid for immediately after the purchase. · (Green is the best color to attract fish) · By using these low amperage/wattage lights you will not have to go spend hundreds of dollars on a generator u can run them off a 12v battery or a battery pack. · Great fishing light for boats, docks, piers, kayaks, canoes, or bank fishing. 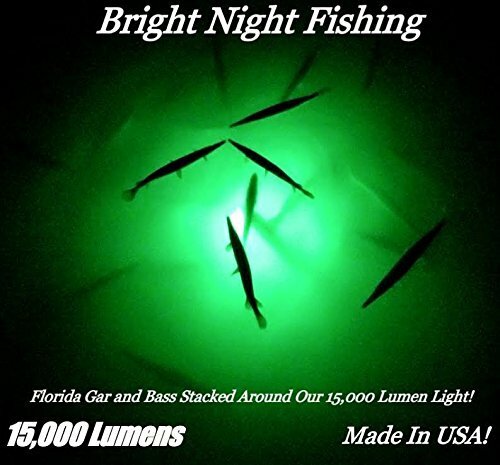 The green light attracts baitfish, which attracts the bigger fish like crappie, bass, walleye, trout, catfish, tuna sail fish, and many other fish. If you have any questions about this product by Bright Night Fishing, contact us by completing and submitting the form below. If you are looking for a specif part number, please include it with your message.